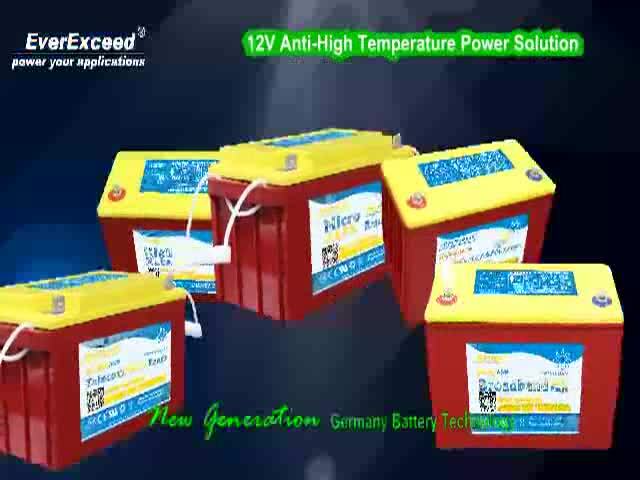 EverExceed's MAX Family Lead Acid Battery video from EverExceed Industrial Co.,Ltd. To meet with the diversified marketing needs, EverExceed R&D department has newly developed the MAX family lead acid battery with unique performance against high temperature, top quality and 12-15 years design life. The new generation long design life MAX Family VRLA Batteries are an ideal energy source for durability in Solar, UPS, Broadband, Telecommunications and Electric Utility applications. They have better performance for high / low outdoor applications, extended service life for non-temperature controlled outdoor enclosures, which applicable Operating temperature range are -40°C (-40°F) to +70°C (+158°F). What's more, we adopt reinforced special high temperature resistant ABS container and cover to ensure the top quality and excellent performance, which will have huge needs in the global marketing.